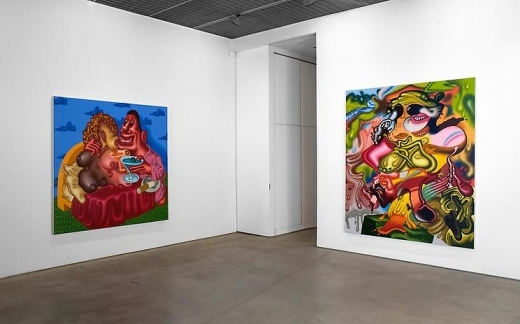 New York, NY March 10, 2009 - David Nolan Gallery is pleased to present a solo exhibition of new large scale paintings by Peter Saul, one of America's quintessential painters of the past fifty years, whose works challenge the cool attitude of post war American art with his own brand of heated and sometimes laughable cartoon expressionism. 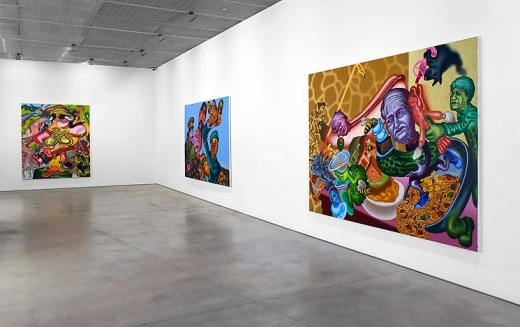 With a forty-year museum retrospective currently traveling, Saul delivers seven new acrylic paintings, created over the last two years that show no signs of quieting down. 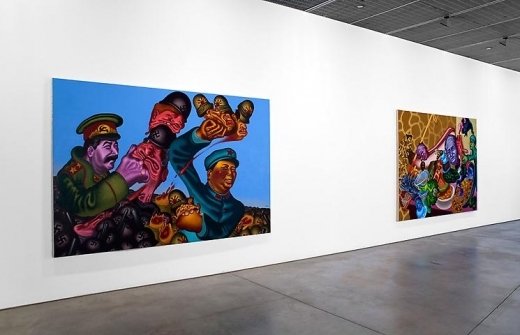 A continuation of his history paintings and absurd lessons in etiquette, the new works shed an uncompromising light on universal crises: racism, feminism, personal hygiene and the actual victors of World War II. 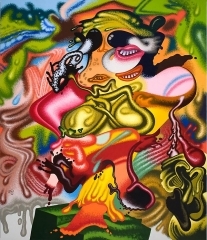 Peter Saul spent his early post graduate years in the 1950's abroad, traveling through Holland, Paris and Rome, experimenting with ways to expand upon the possibilities of postwar gesture painting by incorporating various symbols of American mass culture. His sensationalistic paintings of iceboxes, comic strip superheroes and toilets did not fit into New York's ultra cool idea of Pop Art, exemplified by Roy Lichtenstein's Ben-day dots. Saul was inspired by consumerism as a joke. 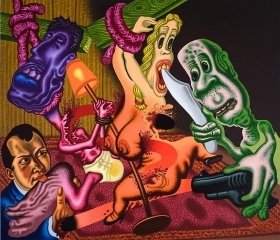 Upon his return to the United States in 1964, he hardened his technique and added saturated color. 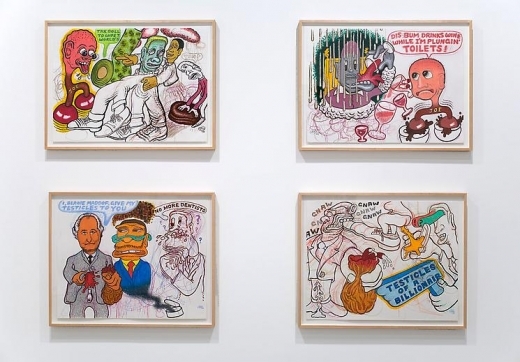 Armed with a new exterior toughness, he dealt with American politics and culture, seeking the obvious and avoiding any hint of artistic deconstruction. 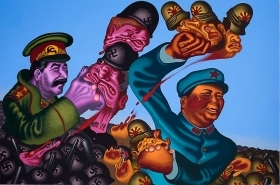 Saul established his reputation as an outsider and a troublemaker in San Francisco in the 1960's by painting violent scenes of racism, blood lust and misogyny, unadulterated hallmarks of the Vietnam War, in the midst of flower-child culture. 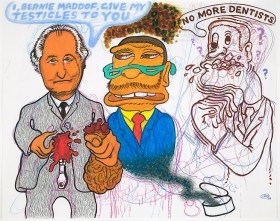 Later that decade, he went on to paint portraits of art world celebrities, including Marcel Duchamp, Frank Stella, Clement Greenberg and his first dealer, Allan Frumkin, all in a spirit of rudeness and psychosexual turmoil. He next pictured leading politicians, most notoriously Nixon and Reagan with the same attitude. 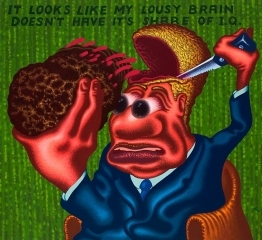 Perhaps feeling he'd gone too far in the direction of personal insult, Saul tried to make amends by repainting famous works by the icons of Cubism and Ab-ex, giving these masterworks the gift of cartoony drawing and fluorescent colors. In the 80's and 90's he imagined the punishments of Ethel Rosenberg, John Wayne Gacy and O.J. Simpson, strapping each into an electric chair and giving them the juice. 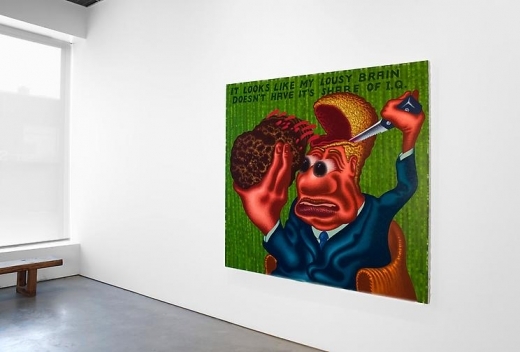 At the age of 74, there is still nothing corporate about Peter Saul. He works without assistants, and while he enjoys looking at photographs, he never copies them because that would interfere with his imagination. The recent works are all about the content, exaggerated by the intensity of Saul's palette consisting of countless pre-mixed acrylics, which he builds up patiently with a dry brush technique that feels like graffiti. 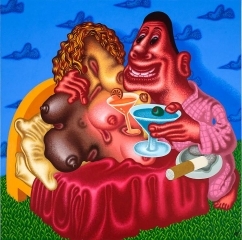 In "Better than DeKooning" (2008), and "Max Beckman's The Night" (2008) Saul continues his legacy, reimagining the famous series of "Woman" paintings from the 1950's and the German Expressionist masterpiece, "The Night" (1918), intuitively into his own contemporary versions. With the problems of painting out the way, Saul takes license to make adjustments, adding violence, color, and mayhem to the originals. 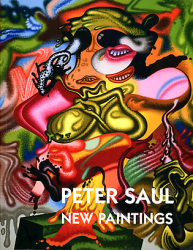 In August 2008, New York Times critic Holland Cotter described Saul as an artist whose ongoing lack of official recognition is unjust. 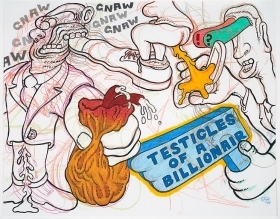 A long list of artists, famous and less than famous, have paid close attention to Saul's work since 1961, watching him break all of the cultural taboos that paint on canvas can handle. 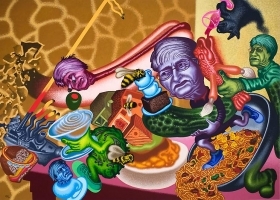 Currently, Saul's third retrospective is traveling the United States; organized by the Orange County Museum of Art with guest curator Dan Cameron, the retrospective debuted at the Orange County Museum of Art, CA (2008), before traveling to the Pennsylvania Academy of Fine Arts and the Contemporary Arts Center, New Orleans, where it is currently on display. 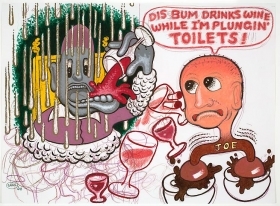 Saul's work has been exhibited widely in the United States and in Europe, and appears in the collections of the Museum of Modern Art, New York, the Whitney Museum of American art, the Centre Pompidou, Paris, the Ludwig Museum, Cologne, the Stedelijk Museum, Amsterdam, the Jack S. Blanton Museum of Art, Austin, the Dallas Museum of Art, the Art Institute of Chicago, the Carnegie Museum, Pittsburg, among others.